The Move Summit 2018 will be India's first global mobility summit is underway, all the highlights from speeches the most reputed dignitaries at the Summit and some exclusive images of Vehicles revealed at the summit and tweets from PM Modi at the summit! Move Summit 2018: India’s is just minutes away from kicking off its first-ever Global Mobility Summit, MOVE. The stage is set for the Summit to be inaugurated by PM Narendra Modi in New Delhi. The move summit will also serve as a platform for Narendra Modi to officially kick off the second phase of the FAME Scheme -- an initiative by the Indian government to help foster the growth of environmentally friendly mobility -- which will look to accelerate the adoption of EVs with incentives and benefits for those who chose to make their commute using eco-friendly vehicles. The summit which will take place over the next two days will look to make Indian cities pollution free and will be addressed by the whos’ who of the Indian auto industry, including Anand Mahindra, Pawan Munjal, Osamu Suzuki and Guenter Butschek. The summit is set to deliberate on five themes, electrification, alternative fuels, reinventing public transport, goods transport and logistics through data analytics. The first of its kind summit will see over 2,200 participants from across the world government, industry, research organisations, academia, think tanks and civil society are expected to attend the event. Live on the grounds of the move summit, this page should have all the information straight from the summit. Stay tuned as India takes the world stage in future, sustainable mobility. Maruti Suzuki reveals first working Electric Car prototypes! Maruti Suzuki's first electric car said to hit roads in India by 2020, has a lot of resemblance with the Maruti Suzuki Wagon R and even shares some styling cues from the Wagon R StingRay. PM Modi also said that Clean mobility is our most powerful weapon in our fight against Climate Change. Clean Mobility powered by Clean Energy is our most powerful weapon in our fight against Climate Change. Mr Munjal cited that almost 34 crore people in India do not even have access to cycles. Saying that even if 10 per cent of this population can be given mobility through cycles, it is estimated that they would grow the GDP by 1 per cent. Huge opportunity comes with challenges. The size of the nation and how vast it is. We need to connect roads with good tech and design. This will help in safety. We need some direction from the government, a roadmap towards electrification says Pawan Munjal, Chairman, Managing Director & CEO of Hero Motocorp. In the presence of Prime Minister Narendra Modi at the MOVE Global Mobility Summit, Suzuki Chairman O Suzuki confirmed that Maruti Suzuki will commence the testing of its electric cars starting next month. Interestingly as we had expected PM Modi did not speak on the FAME 2 scheme but said the summit is just beginning and a lot is yet to come. He appeals to the young dynamic Indians to drive future mobility solutions, asking them to embrace change and be the leaders of the future. Modi says that based on the fact that India has fewer cars per capita than other economies with similar strength, thus not having the baggage that has been built on the backs of the private vehicle ownership. He says India is already the 5th largest producers of Solar Energy and the 6th largest producers of renewable energy in the world. India's young digitally capable population will be the major factor in driving a change in mobility. PM Modi says Indian is on the move, India's economy is on the move as the fastest-growing major economy. Modi says 100 smart cities will be the future in India. Modi says India is now an easier place to do business and says the world is in the process of transformation of mobility. Mobility that is in-sync with the environment is the future. Aggarwal is the youngest CEO at this summit. He says roads and highways are our "bhagya rekha" (or life force) quoting late Prime Minister Atal Bihari Vajpayee. He says without Ola an additional 3 million vehicles would have been brought to the roads adding to congestion. Aggarwal says that they are looking to transition to Electric Vehicles soon. Are you ready to plug into the #FutureOfMobility with #EVs?Share your thoughts with us using #GMS2018MOVE: The Global Mobility Summit on 7th and 8th September 2018. Guenter Butschek thanks NITI Aayog for organising the summit. He says that India is not only a shining star among the World Economies and will also be a shining example of future mobility. Butschek applauds the government for their clear strategies like Swachh Bharat, Make In India. He aslo speaks positively about advent GST. Earlier in Hannover Messe ABB had unveiled a unique fast charger that will now come to India. By operating at powers of up to 350 kilowatts, the newest model from ABB, Terra High Power charger, adds up to 200 kilometres of range to an electric vehicle in just 8 minutes. The new charger is ideally suited for use at highway rest stops and petrol stations. Uchiyamada Speaks about a 21st-century vehicle as his first challenge; speaking of his idea for the revolutionary hybrid technology as early as 1997 with the Prius. Over the years, Toyota hybrid vehicles have saved more than 94 million tonnes of Carbon emissions. Outlines that hybrid vehicles need no ecosystem but still make a large dent in fuel used and carbon emissions. Denner speaks of synthetic fuel to bring ICEs as close to zero emission as possible, advanced safety features and multi-modal mobility. Asks the congregation to look at vehicles that will reduce congestion and drive a movement towards connected mobility! Suzuki says that Suzuki in collaboration Toyota will launch their first EV in India by 2020 in-line with the Make in India Initiative. He asks for a good governance such that a sustainable ecosystem for EVs is created. He ends his speech expressing excitement for EVs to start plying on Indian roads in higher numbers. Hybrid vehicles, Electric Vehicle, Fuel Cell Vehicle and Connected Vehicles will be the four pillars of future mobility. He says Hyundai will launch three EVs in India in the years to come. He says he has been deeply moved by the hospitality of India, a key factor in India becoming a regional Headquarter for Hyundai in India. VC of Hyundai says that the fourth Industrial revolution is upon us and that we should embrace this change. A change that will move us away from personal mobility to smart and shared mobility. Anand Mahindra takes the stage and says that Mobility is about the joy of the freedom of the mobility. Future generation is changing the way we commute and that we should worry about shared mobility. The railways brought mobility that sowed the seeds of freedom like the railways changed the way India commutes. Questions whether we can have a single app to connect all mobility. He says inclusive multi-modal mobility can outline a way forward. Says app should be called MOVE in honour of this historic summit! Of all the disruptive technologies of our generation, mobility will be the most prevalent, as the world witnesses a shift from conventional Internal combustion to electrically powered vehicles. 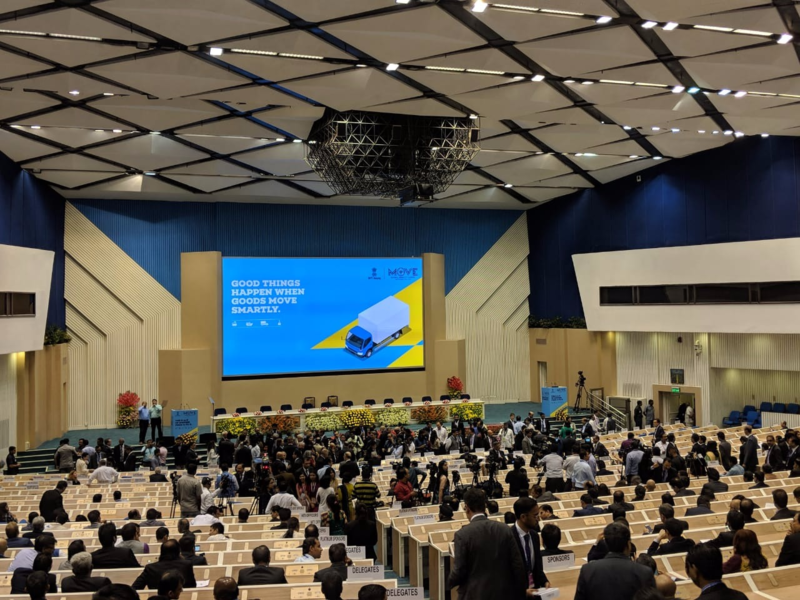 Speaking to congregation, PM Modi assures that the Summit will shed light on jobs, battery tech, data analytics and policy framework for electric mobility. Honda Cars showcases it's hybrid and electric range to PM Modi virtually. Honda also showcases it's Mobile Packed World. PM Modi visits exhibits sees Indian made-GPS technology and smart traffic signals. He then heads to the Hyundai Stall where he interacts briefly with Hyundai's global management present at the Summit. The officials present their Electric Car plan. 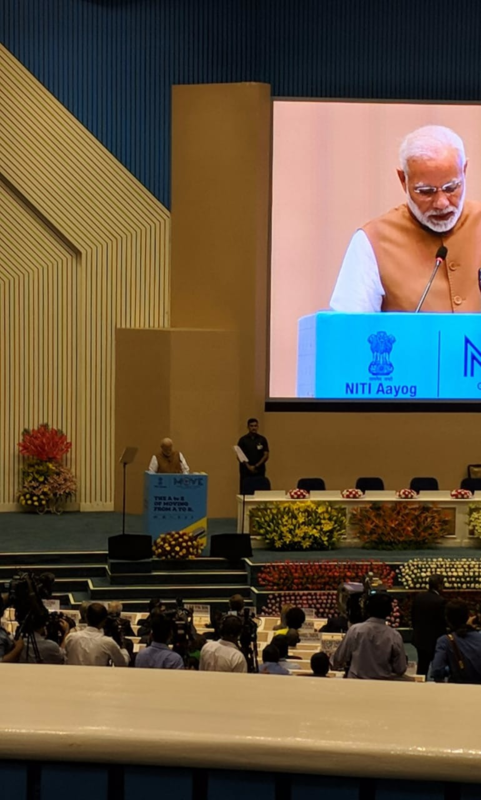 NITI Aayog has consulted with various state governments over the last few weeks, to ensure that state-specific issues will be addressed to evolve a shared connection, zero emission and inclusive mobility agenda for the future. The morning started with this tweet from PM Modi announcing the summit! Mahindra XUV300 Review: Better Safety, Features than Maruti Brezza, Ford EcoSport, Tata Nexon! 2018 Hyundai Santro Review: Rs 700 crore development cost! Good enough or not?